We spent the weekend in Las Vegas, aka Sin City, and then Monday we found ourselves camped on the edge of Death Valley, in the middle of nowhere. What a contrast that was. Our motel in Las Vegas was on the older, downtown end of the “strip”. 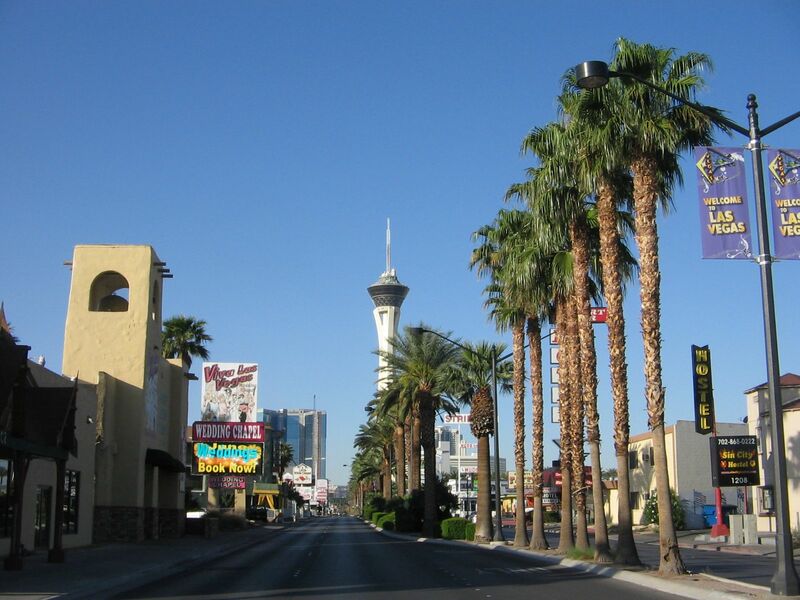 Businesses in this part of town were not the glitzy casinos like the other end of the strip. In our block there were a number of old-fashioned wedding chapels that featured Elvis impersonators, pink cadillacs, white limousines and anything else to help recreate the romance of the past. Street view from the front of our hotel in Las Vegas. We didn’t need to be close to the casinos on the strip because we weren’t there to participate in the party scene. Our friend, Wayne, was in Las Vegas visiting family for the week and we couldn’t pass up the opportunity to connect with someone from Virginia who has been a great help to us on our travels. 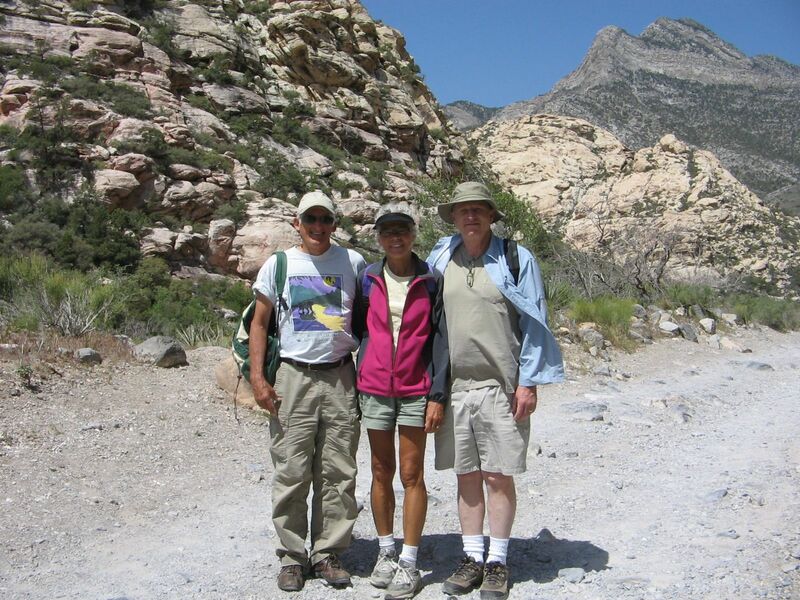 We’ve enjoyed hikes back East with Wayne and it was fun for the 3 us to get together again, this time for a hike in Red Rock Canyon National Conservation Area. 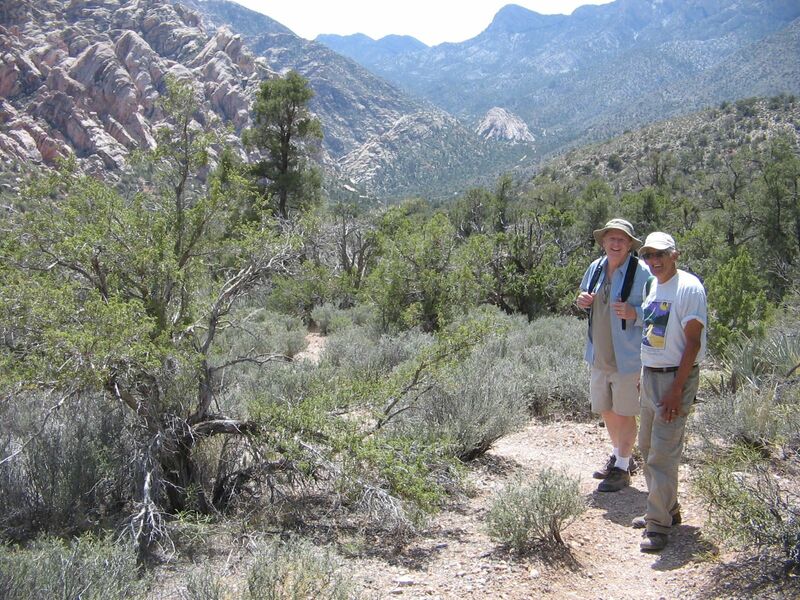 Starting the hike with Wayne on the White Rock/La Madre Spring Loop trail in Red Rock Canyon Climbing higher in the canyon Showing rock contrasts. Red bud trees in blossom along the trail. La Madre Spring. Surprising to see any water in what is mostly a barren desert landscape. Climbing a rock for a better view. Approaching the downhill section of the hike. 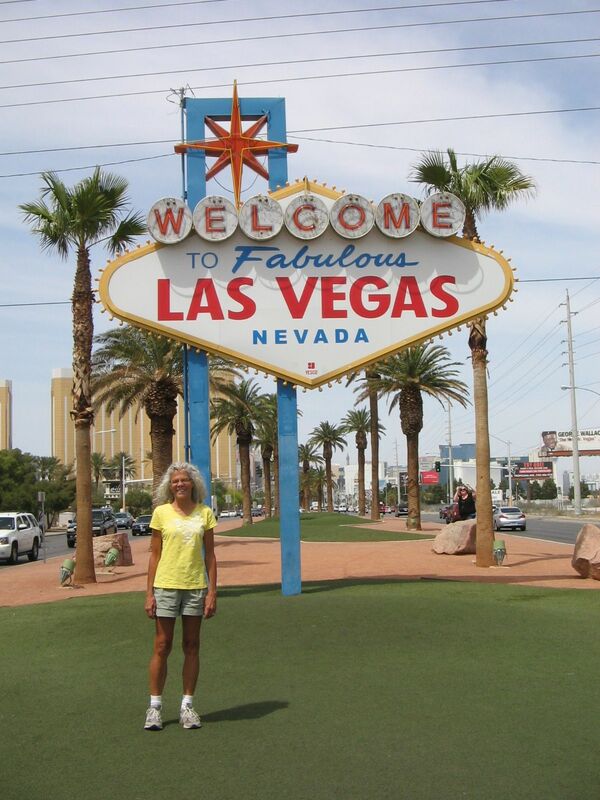 On Sunday afternoon we said goodbye to Las Vegas and continued our journey westward into California. Our destination for the night was a campground at Tecopa Hot Springs, California, which is in the low desert of eastern California near Death Valley. The hot temperatures had returned. 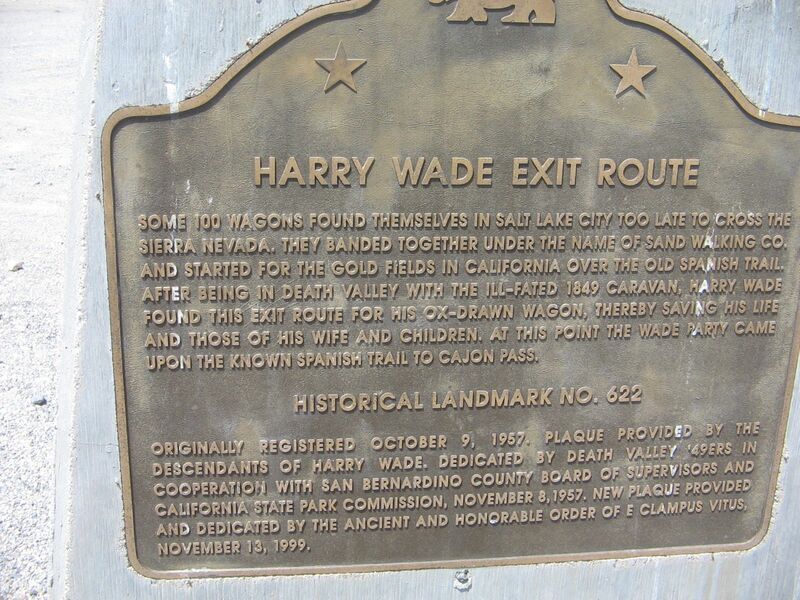 Parts of our route overlapped the historic Old Spanish Trail trade route. We were on a secondary highway, not the interstate. Driving in the comfort of an air-conditioned car it was hard to imagine how the early pioneers made it through this desolate place. 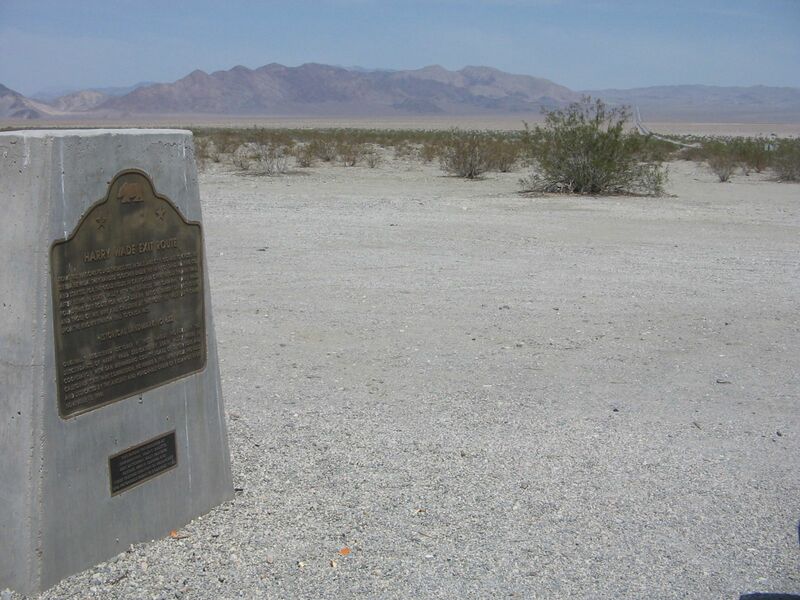 The photo below is an example of one place we stopped the car in a desert valley to read a historic sign. Notice the road that we were driving on in the upper righthand corner of the photo. The sign itself was an intriguing story helping us to imagine what it must have been like here for early travelers. 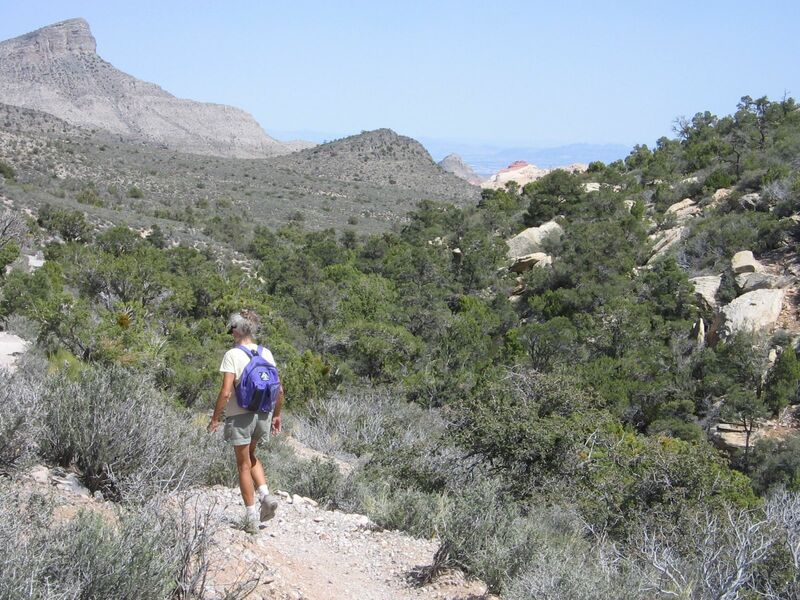 As we approached Tecopa Hot Springs we weren’t sure what to expect. From a distance it appeared that there might be a lake of some sort there. As we got closer we could see that if there was a lake it sure didn’t have much water in it. This wasn’t a lake that had dried up because of recent drought conditions. 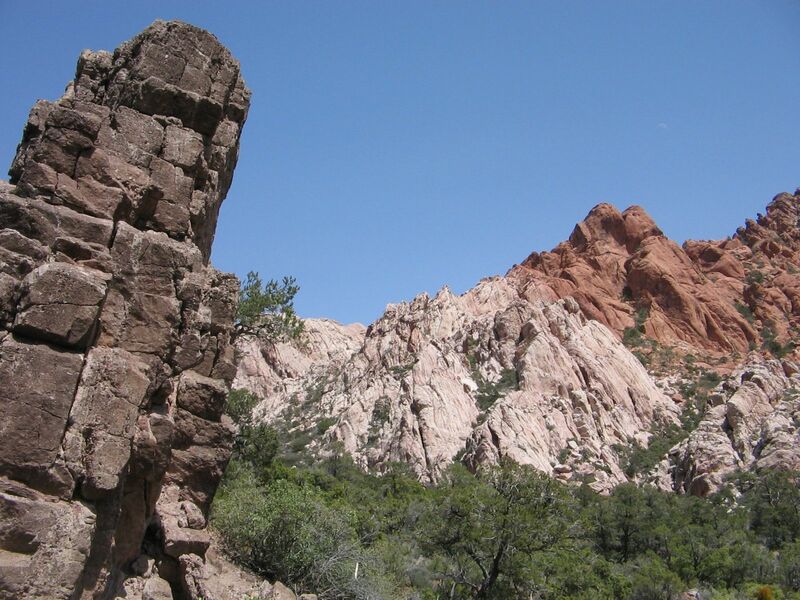 We were seeing just a small example of what are called Pleistocene Lakes–lakes that haven’t had water for thousands of years. 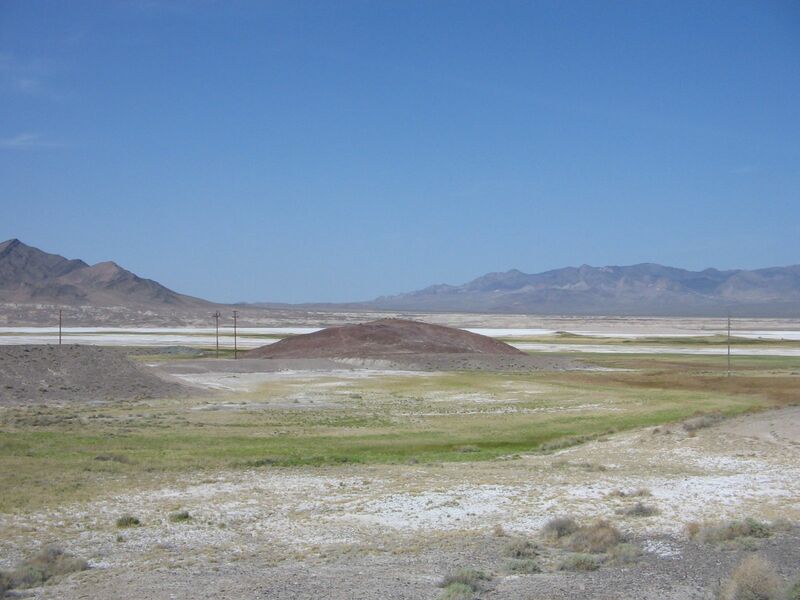 These are the kinds of lakes that cover Death Valley and the Mojave Desert. The town of Tecopa is rather rundown, but there were visitors taking advantage of the hot springs resorts that are there. You could call it a hot springs haven for the less well-to-do crowd. Out in this barren country we had been fortunate to find any place that had facilities for tent campers like us. The sun was beating down and most of the campground was out in the open. 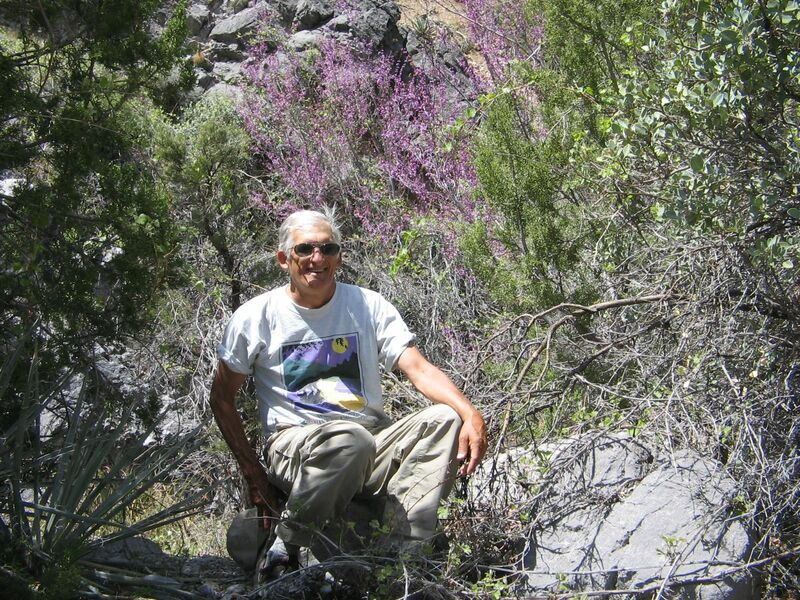 But with so few of the sites taken we were able to get one of the sites that had a shade tree. 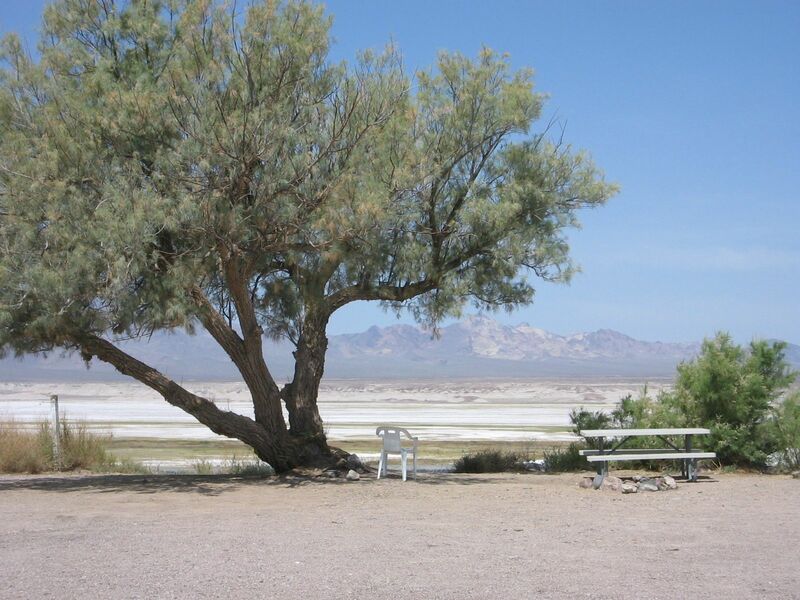 View from Tecopa Hot Springs Resort campground. It’s been thousands of years since there was any water in this “lake”! 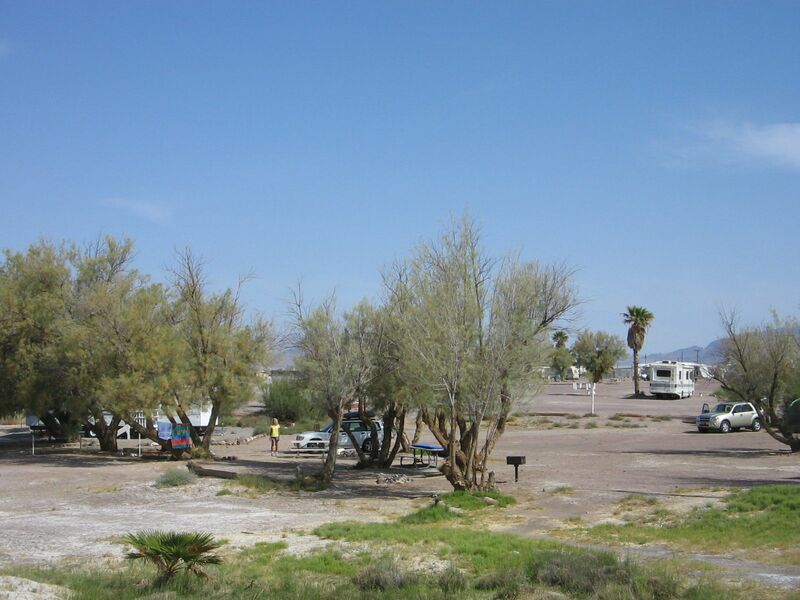 Our campsite at Tecopa Hot Springs Resort. It was nice the next morning to take showers at the bathhouse that was also the pool for the hot springs. I wasn’t bold enough to strip to my birthday suit and join the other ladies in the hot pools but instead just enjoyed the soothing warmth of the showers. 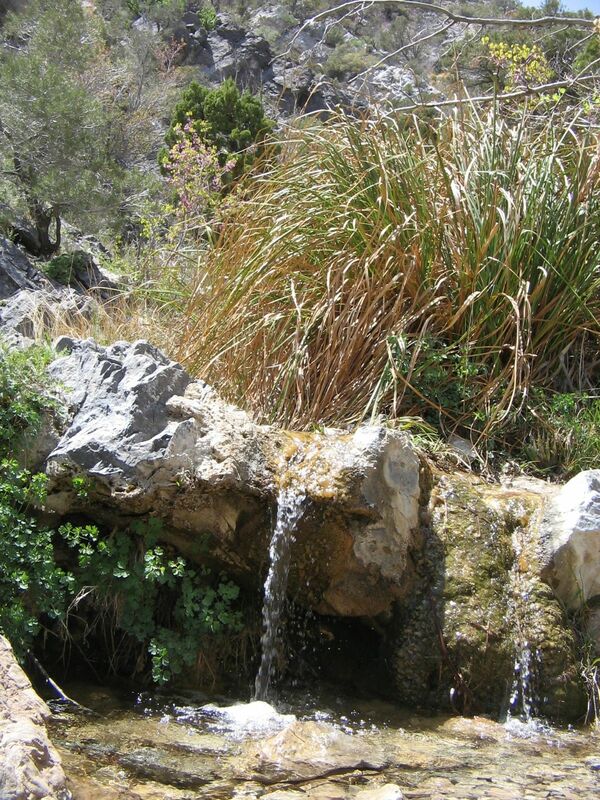 The small stream that forms the pools flows past the campground out into the vastness of the dry lake. You could put your hand in the water of the stream and it was very warm to the touch. Green grass is visible in patches in the distance where the water collects. We took a short walk out into the dry lake to climb the red mound in the distance for a better view. 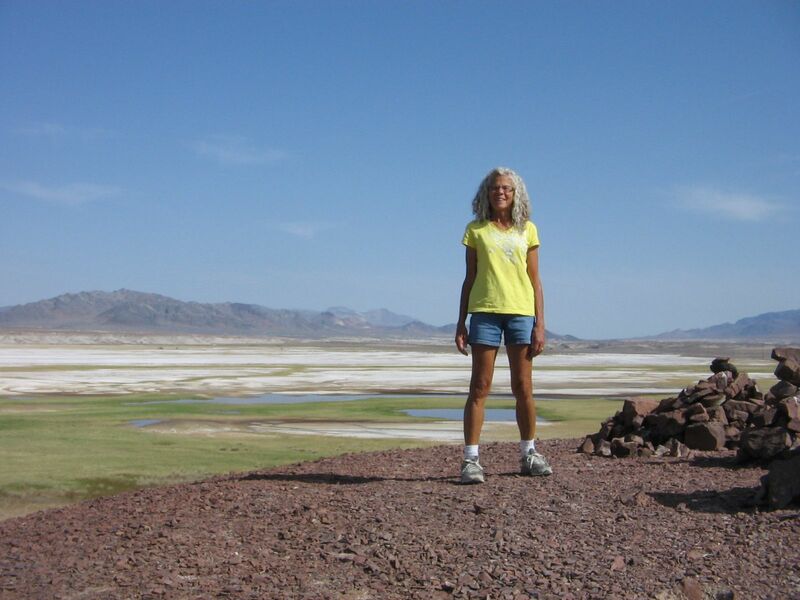 On top of the red mound in the dry lake at Tecopa Hot Springs. Yesterday after some more miles driving through the desert it was time to rejoin the main highway on California’s Interstate 15 at the town of Baker. 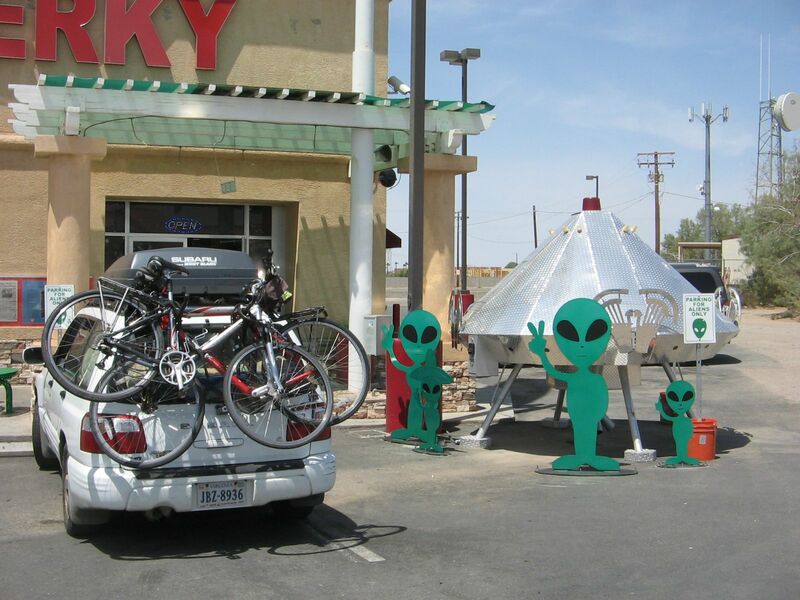 This was a fun place, not just because it was our lunch stop, but it did have some California weirdness to appeal to travelers like us. 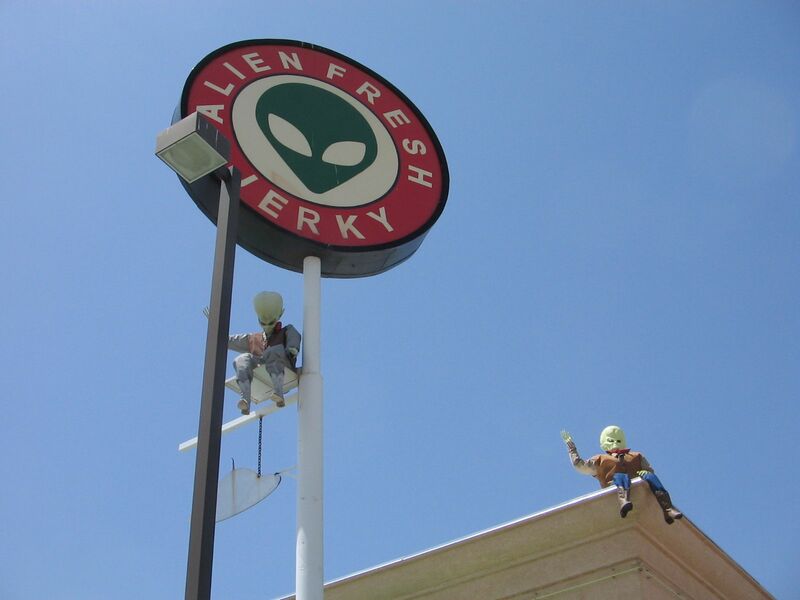 For example, the store that sells Alien Fresh Jerky. We couldn’t pass that by. We are now in a motel in Barstow, California, thankful that we aren’t camping because the weather has once again turned very windy and much cooler. The wind blew all night and it would not have been pleasant in our tent. Today’s drive will take us to North Hollywood, where we will visit family for several days. We will do some sightseeing on the way, since it isn’t too far. And then I’m sure there will be many more sights to see in the big city of LA. Eureka! 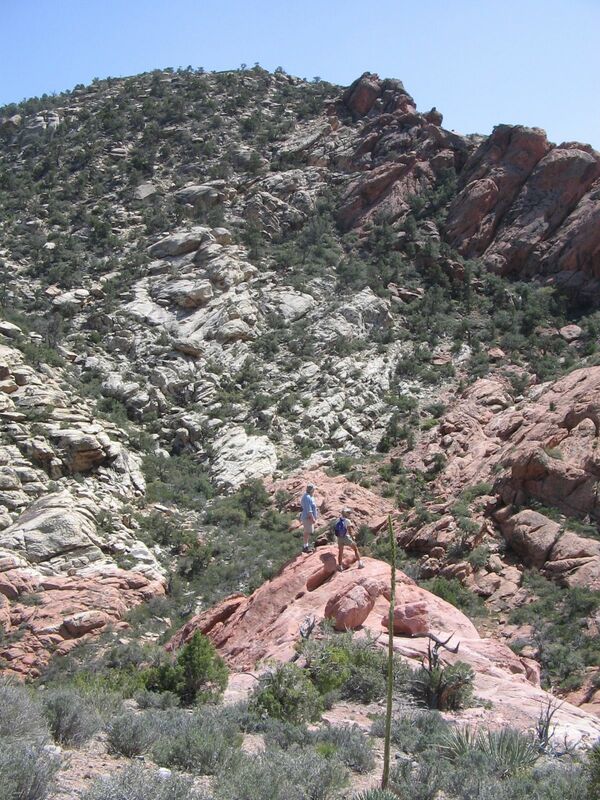 From Sin City to Death Valley and sampling alien Beef Jerky….Wow.